Are Dividend Investors Benefiting from Stock Buybacks? Corporations typically return cash to shareholders in two ways – through share buybacks or in the form of dividends. In a previous article I compared and contrasted both methods of returning cash to shareholders. My analysis of Chubb (CB) spurred a lively discussion among readers, some of which use Net Payout Yield. The net payout yield represents the total amount of cash paid for dividends and spent on share buybacks, divided by the market value of the company. Some investors believe that this should be taken in consideration, whenever someone analyses a stock. The most interesting part in this exercise is that the highest price for Chubb stock was $66 reached in 2011. Before that, the highest price was in 2008 at $65. What the company is not showing is that it is repurchasing shares, yet it is also issuing shares most probably to executives who have chosen to exercise their stock options at ridiculously low prices. The company has spent $1.88 billion on dividends over the past 4 years. However, it has spent $6.24 billion on share repurchases. It spent 3.30 times more on buybacks than on dividends. An investor with 4.23 million shares in 2006 would have owned 1% of the entity, whereas now they would own 1.30% because of the anti0dillutive effect of share repurchases. However the stock ended 2006 at $53. Had all the cash been paid out as dividends, the investor would have received $19 in dividends/share over a 4 year period (for a 36% return). ( I get to $19 by adding up 1,881 billion spent for dividends and the 6,237 billion spent for buybacks and assuming the number of shares stayed constant, and then dividing by 423 million shares). Instead, the investor received $5.36 in dividends in total for 2007, 2008, 2009, and 2010. The stock closed 2010 at $60. So the total return was 23%. I also analyzed three of the largest dividend paying stocks, which repurchased massive amounts of stock over the past several years. The companies include Wal-Mart (WMT), Exxon-Mobil (XOM) and IBM (IBM). ExxonMobil (XOM) shareholders would have received $21.61/share between 2007 – 2010 has all the cashflow been returned in the form of dividends (for a 28.20% return). Instead, shareholders received a paltry $6.32/share over the 2007-2010 period. The stock closed 2006 at 76.63and traded at 11.60 times earnings. The stock closed 2010 at 73.12 and traded at 11.80 times earnings. The amounts paid per each repurchased share appear reasonable. The increase in share count in 2010 was prompted by the acquisition of XTO energy. Check my analysis of XOM. Wal-Mart Stores (WMT) shareholders would have received $11.82/share between 2007 – 2010 has all the cashflow been returned in the form of dividends (for a 25.30% return). Instead, shareholders received a paltry $4.13/share over the 2007-2010 period. The stock closed 2006 at 46.18 and traded at 17.40 times earnings. The stock closed 2010 at 53.93 and traded at 12.90 times earnings. When looking at the amount paid per share over the past 4 years, investors should remember that the stock price never went above $63 during our study period. While the share buybacks might not have been beneficial to ordinary WalMart (WMT) shareholders, they have been helpful for the Walton family. The Walton family stake in Wal-Mart has increased to above 50%, mainly due to the fact that the family is holding on to their stock, while the company is using shareholder’s cash to repurchase stock held by others. Check my analysis of WMT. It seems that IBM (IBM) shareholders would have received $40.53/share between 2007 – 2010 has all the cashflow been returned in the form of dividends (for a 41.70% return). 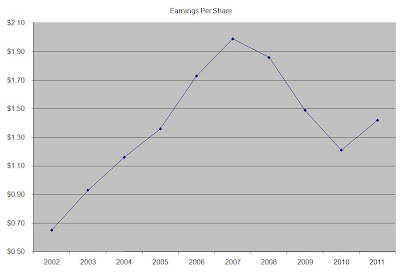 Instead, shareholders received a paltry $8.05/share over the 2007-2010 period. The stock closed 2006 at 97.15 and traded at 16 times earnings. The stock closed 2010 at 146.76 and traded at 12.70 times earnings. The amounts paid per each repurchased share look particularly out of line, given the fact that IBM never traded above $150 until early 2011. Check my analysis of IBM. Of course, over the long term, (after 10-20 years), the price of each of the stocks mentioned above would be much higher than what it trades for today. As a result, the partners in the business who sold below at current prices would be kicking themselves for their sell decisions between 2007 -2010. However, the partners in the business who held on to their investment would have seen this share repurchase as a smart option. To summarize however, I would much rather receive special dividends, than get share buybacks. Altria Group’s Board of Directors announced a fresh dividend hike over the past week. Owning shares of this company for several years has delivered a rising stream of dividend income to me, and an appreciation of the simple truths mentioned above. Check my analysis of the stock. Altria Group, Inc. (MO), through its subsidiaries, engages in the manufacture and sale of cigarettes, smokeless products, and wine in the United States and internationally. The company increased its quarterly distributions by 7.90% to 41 cents/share. This marked the 44th consecutive annual dividend increase for this dividend champion. Despite all the issues that tobacco companies have faced over the past decade, the increased regulation has created an environment which has helped deliver solid results for shareholders. While the number of smokers decreases each year, the increases in cigarette prices more than compensate for that. In addition, it is almost impossible for a new cigarette manufacturer to create a brand to compete with established players like Altria Group (MO). Despite all the gloom, the company has been the best performer in the S&P 500 over the past 50 years. Investors, looking at the historical distributions of Altria since 2007, see a big dip in dividends. There is a rational explanation for this however - Altria spun off Kraft (KFT) in 2007 and Phillip Morris International (PM) in 2008. As a result, investors who purchased Altria (MO) stock at the end of 2006 would own shares of Altria (MO), Phillip Morris International (PM) and Kraft (KFT), all of which have increased distributions over the past 5 years. As a result, this investor would have received a rising stream of dividend income in each of the past 5 years since the spin offs began. Standard and Poor’s eliminated Altria from its list of dividend aristocrats in 2008, which was a move that is almost as wrong as reducing the rating of the US in recent weeks. The company’s shareholders didn’t suffer reduced dividend income, which is why the S&P’s move to boot Altria from the elite dividend index was highly suspect. This is the primary reason why I am mostly ignoring the dividend aristocrats index and focusing on the dividend champions index exclusively. Sysco Corporation (SYY), through its subsidiaries, markets and distributes a range of food and related products primarily to the foodservice industry in the United States. Sysco is a dividend champion has paid uninterrupted dividends on its common stock since 1933 and increased payments to common shareholders every year for 41 years. The most recent dividend increase was in November 2010, when the Board of Directors approved a 4% increase to 26 cents/share. Over the past decade this dividend growth stock has delivered an annualized total return of 3.90% to its shareholders. The company has managed to deliver an increase in EPS of 9.50% per year since 2001. Analysts expect Sysco to earn $1.97 per share in 2011 and $2.07 per share in 2012. In comparison Sysco s earned $1.99 /share the company earned in 2010. The company has managed to consistently repurchase 1.50% of its common stock outstanding over the past decade through share buybacks. The company’s near term growth prospects will be limited due to fewer Americans going out to eat due to the high unemployment. Additionally, high food inflation and the inability of the company to pass on all of these sharp price hikes on to cash strapped customers from the restaurant industry, which accounts for almost two-thirds of sales, have trimmed earnings growth. Longer-term however, as working adults have less time to prepare meals at home, the business of companies like Sysco should benefit. Increasing the number of distribution centers as well as better management of inventory costs would add to profitability as well. Other areas where Sysco will look to grow earnings include increasing the amount of consolidated purchasing as well as through acquisitions in the US and abroad. The company has managed to generate high returns on equity, which had consistently remained above 29%. Rather than focus on absolute values for this indicator, I generally want to see at least a stable return on equity over time. The annual dividend payment has increased by 15.30% per year over the past decade, which is much higher than the growth in EPS. A 15% growth in distributions translates into the dividend payment doubling almost every five years. If we look at historical data, going as far back as 1975, we see that Sysco has actually managed to double its dividend every four years on average. Over the past decade the dividend payout ratio increased from 26% to 49%. The primary reason behind this steep increase was that dividends increased at almost twice the rate of earnings growth. A lower payout is always a plus, since it leaves room for consistent dividend growth minimizing the impact of short-term fluctuations in earnings. Currently Sysco is trading at 13.90 times earnings, yields 3.80% and has a sustainable dividend payout. The company currently fits my entry criteria and I would look to add to my position in it subject to availability of funds. We live in challenging times. Commodities such as oil, gold and silver are going up amid speculation that we are going to have high inflation. Given the ample liquidity pumped into the financial system by central bankers around the world, speculators are bidding up precious metals. In addition, investments such as treasury bonds generate yields which are very low. Chances are that these fixed income instruments would lose purchasing power if inflation accelerates. Other “growth” investments such as Linkedin (LNKD), Pandora (P), Groupon and Facebook seem to be generating investors’ interest because they are part of “social media”, despite the fact that their valuations are unsustainable. So how can investors maintain their sanity, generate returns and live off their portfolios in such uncertain world? The answer is in dividend growth stocks. Only companies which have solid financial results tend to share a portion of their income with shareholders in the form of dividends. Companies which are weak or focus on growth at all costs tend not to pay a dividend, which means that investors can generate a return on investment only if a greater fool bids up the stock price. On the other hand, companies that pay a portion of their earnings as dividends, generate a consistent return to shareholders. This is a definite plus when stock prices are falling or going sideways for extended periods of time. As a result companies that regularly pay rising dividends to shareholders, tend to be favored by long term holders. The reason behind the appeal of dividend growth stocks is that only companies which fit certain quantitative and qualitative criteria can afford to create a string of consecutive dividend increases. Qualitative characteristics include strong competitive advantages, strong market share, diversification of operations on a global scale , investment in innovation as well as strong brand names which consumers use on a daily basis and for which they can afford to pay a premium price. At the end of the day, even if we experience another recession, consumers would keep eating, shaving, showering, using water and electricity or talking on the phone. Quantitative criteria include items such as dividend growth, earnings growth, valuation, and return on equity or current yield. Companies that raise dividends also provide a rising stream of income which retirees could use to live off their portfolios. As a result, investors would not have to worry about selling their growth stocks when the market tanks in order to pay their monthly expenses. The rising dividend stream also ensures that retiree’s incomes are keeping up with inflation. Over time the increase in earnings and dividends makes the company more valuable, which leads to increases in share prices as well, as more investors realize that the shares are undervalued. This is just a sample of quality dividend growth stocks which are sufficiently profitable to afford a rising dividend payment in good times and in bad times. Several companies raised distributions over the past week. The companies which I highlighted in this article have each raised dividends for at least five years in a row. These companies also announced dividend increases over the past week. I typically utilize this list in order to find hidden dividend gems. One hidden dividend gem uncovered was Hingham Institution for Savings (HIFS), which has delivered a 61.60% total return since I analyzed the stock in April 2010. Illinois Tool Works Inc. (ITW) manufactures a range of industrial products and equipment worldwide. Illinois Tool Works is a dividend champion, has paid uninterrupted dividends on its common stock since 1933 and increased payments to common shareholders every year for 47 years. The most recent dividend increase was in August 2010, when the Board of Directors approved a 9.70% increase to 34 cents/share. The largest competitors of Illinois Tool Works include Timken Co (TKR), Kaydon Corp (KDN) and SKF AB (SKFRY). The company has managed to deliver an increase in EPS of 9.70% per year since 2002. Analysts expect Illinois Tool Works to earn $3.93 per share in 2012 and $4.59 per share in 2013. In comparison Illinois Tool Works earned $3.03 /share the company earned in 2011.
managers are given the authority to make important business decisions. This decentralized organizational structure lets managers get results by doing what is best for the particular operational unit. The returns on equity are on the rebound, after hitting a low of 11.80% in 2010. Right now this indicator is on the rebound, as higher expected earnings would certainly improve returns on equity. Rather than focus on absolute values for this indicator, I generally want to see at least a stable return on equity over time. The annual dividend payment has increased by 13.40% per year over the past decade, which is much higher than the growth in EPS. A 13% growth in distributions translates into the dividend payment doubling almost every five and a half years. If we look at historical data, going as far back as 1987, we see that Illinois Tool Works has actually managed to double its dividend every five years on average. Over the past decade the dividend payout ratio increased from 32% to 42%. A lower payout is always a plus, since it leaves room for consistent dividend growth minimizing the impact of short-term fluctuations in earnings. Currently Illinois Tool Works is trading at 11 times earnings, yields 3.20% and has a sustainable dividend payout. I would consider adding to my position subject to availability of funds. Why I am a dividend growth investor? I am a dividend growth investor because my research has uncovered that dividend growth stocks perform very well over time. I purchase stocks in solid companies which pay dividends, and regularly increase them each year. This is the strategy I am using in order to live off dividends in retirement. My research shows that a portfolio of carefully selected dividend stocks will provide a sufficient income stream for me to live on, without having to touch principal. The fact that the companies I purchase also grow earnings to pay growing distributions each year means that over time stock prices would go higher, thus providing some protection to my capital from inflation. My neighbor is not a dividend investor. My neighbor purchases index funds and hopes to rely on an asset depletion strategy commonly referred to as the four percent rule. You can read more about the original research about it here. Basically, my neighbor is relying on total returns from index funds, in order to fund their retirement. Historically, stocks have produced an annual return of 9% - 10% per year. If one owns $1 million worth of an S&P 500 index fund, their return would be approximately $90-$100 thousand per year. Thus, selling $40,000 worth of stock each year would lead to a portfolio value of 1,050 to 1,060 million by the end of first year. This was a good strategy for generations of do it yourself index investors. Accumulate as much in index funds as possible, and then sell off 4% of your initial portfolio value each year, while also adjusting for inflation. The one problem that this strategy creates is that it leads to a rapid depletion of the asset base during extended bear market declines or during flat markets. Stocks do not go up or down in a straight fashion each and every year. Investors who retired in the early 2000s and 2007-2009 saw this first hand. 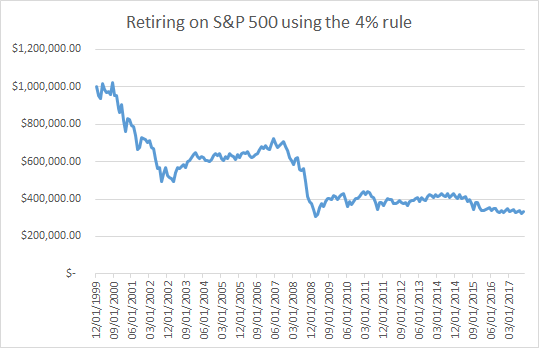 In fact investors who put $1 million in an S&P 500 mutual fund in 1999 and using the 4 percent rule for withdrawals now have only $360,000 left. The calculations assume a 3% annual inflation rate and a quarterly distribution. In addition, investors would have sold more than half of the shares they originally owned by August 2011. Given the expected withdrawal of $55,369 in 2011, the portfolio would be depleted in 6.50 years if stocks do not appreciate by 2020. I have always had an issue with index funds. They are a decent vehicle for accumulating wealth, as they provide ordinary savers with the ability to have exposure to the stock market without understanding much about it. However, the traditional methods of selling off portions of your portfolio each and every year, is similar to cutting off the tree branch you are sitting on. That’s why the idea of creating a dividend portfolio makes perfect sense for investors who are retired and even those who plan to retire some day in the future. Using this strategy, investors only spend the dividend income generated by their investments. Dividend income is more stable in comparison to relying exclusively on price appreciation. If you compare the price returns of my benchmark the S&P 500 index to the dividend returns you would see why retirees prefer the stability of dividends in retirement. Dividend investors should carefully select stocks with solid fundamentals which could afford to grow distributions for years to come. They should also have a set of written rules, which would help them in evaluating stocks. You could read more about my entry criteria in this article. Investors should also try to create a diversified portfolio in order to minimize sector risks on their dividend income. There are approximately 300 dividend growth stocks in the world. After further screening, the enterprising dividend growth investor would likely find a more manageable list of 40 -50 securities which could be accumulated at the right prices. By relying exclusively on spending only the rising income stream, investors would avoid depleting their asset base by selling off shares every year. As a result, dividend investors would not have to sell in a depressed market in order to pay for their living expenses and risk depleting their assets. Instead, dividend investors generate stable dividend income which rises over time and ensures that they generate an inflation adjusted stream of income. Dividned growth investors could thus avoid paying attention to rising and falling prices, because their dividends arrive timely, like clockwork. In essence, it feels as if dividend investors are getting paid for holding these stocks. Contrast this to the traditional model of retirement investing, where a flat or declining market would lead to outliving your assets and having to return back to work at the most unfortunate times for you. Looks like the investor from 1999 would have $330,000 left today. 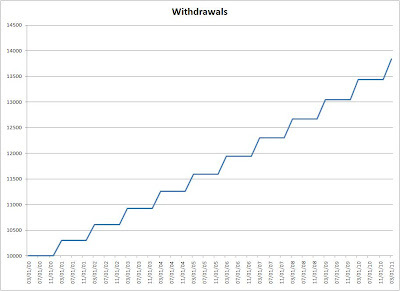 Their annual withdrawals are now up to $66,114, which is equivalent to a 20% withdrawal rate at the current balance. This retiree is scheduled to run out of money in 5 years. It is very likely however that this person would have bailed out on their investments a long time ago, and would have returned to work. The stock market delivered another rollercoaster week for investors. Luckily, as dividend investors, we kept receiving distributions on time. In addition, many companies keep raising distributions, despite the gloomy outlook on the economy. I have written before that dividend payments represent a more stable return than relying on capital gains for funding your retirement needs. In essence, investors who live off dividends in retirement from their diversified portfolios of blue chip dividend stocks and never touch principal, can ignore the day to day fluctuations in the market. These investors are essentially getting paid for holding these quality dividend stocks. Badger Meter, Inc. engages in manufacturing and marketing liquid flow measurement and control technology products worldwide. The company increased its quarterly dividend by 14.30% to 16 cents per share. Badger Meter, Inc. is a dividend achiever, which has increased its quarterly dividend in each of the past 19 years. The stock currently yields 1.90%. Textainer Group Holdings Limited (TGH), through its subsidiaries, engages in the purchase, ownership, management, leasing, and disposal of intermodal containers worldwide. The company increased its quarterly dividend by 6.50% to 33 cents per share. This was the third dividend increase for Textainer Group Holdings Limited in 2011, which has increased its quarterly dividend in each of the past five years. The stock currently yields 6.50%. Acme United Corporation (ACU), together with its subsidiaries, develops and markets cutting, measuring, and safety products to the school, home, office, hardware, and industrial markets in the United States, Canada, Europe, and Asia. The company increased its quarterly dividend by 16.70% to 7 cents per share. Acme United Corporation has increased its quarterly dividend for 8 consecutive years. The stock currently yields 3%. Ritchie Bros. Auctioneers Incorporated (RBA), which is an industrial auctioneer, that sells various equipment to on-site and online bidders worldwide, increased its quarterly dividend by 7.10% to 11.25 cents per share. Ritchie Bros. Auctioneers has increased its quarterly dividend for 9 years in a row. The stock currently yields 2.10%. Torchmark Corporation, through its subsidiaries, provides individual life and supplemental health insurance products, and annuities to middle income households. The company increased its quarterly dividend by 9.10% to 12 cents per share. This was the second dividend increase for Torchmark Corporation in 2011, which has increased its quarterly dividend for 6 years in a row. The stock currently yields 1.30%. Lowe's Companies, Inc. (LOW), together with its subsidiaries, operates as a home improvement retailer in the United States, Canada, and Mexico. Lowe’s is one of the original dividend aristocrats, has paid uninterrupted dividends on its common stock since 1961 and increased payments to common shareholders every year for 49 years. The most recent dividend increase was in May 2011, when the Board of Directors approved a 27.30% increase to 14 cents/share. The largest competitor of Lowe’s includes Home Depot (HD). Over the past decade this dividend growth stock has delivered an annualized total return of 3.40% to its shareholders. The company has managed to deliver an increase in EPS of 9.10% per year since 2002. Analysts expect Lowe’s to earn $1.64 per share in 2012 and $1.90 per share in 2013. In comparison Lowe’s earned $1.42 /share the company earned in 2011. The company does face some strong macroeconomic factors, the chief one being the slow housing market and the relatively high unemployment as of late. The company has been able to maintain its position by improving customer service and improving operational efficiencies. Repurchasing shares would also help in EPS growth. In the longer run, aging of homes should be beneficial for companies like Lowe’s, as homeowners would be spending more funds on projects related to maintaining the appeal of their residences. Over the next few years, the company would generate sales growth by increasing the number of stores by 1.5% per year. Increases in same store sales should also add to the bottom line. The company is focusing on expanding its international presence, as it currently has 24 stores in Canada and 2 in Mexico. The stores in Mexico were opened in 2010, while the Canada operaions added 8 new stores in the past year. In addition, the company has a joint partnership with Australian retailer Woolworths, to develop home improvement stores in Australia. The returns on equity have declined from a high of 21% in 2006 to a low of 9.60% in 2010. Right now this indicator is on the rebound, as higher expected earnings would certainly improve returns on equity. Rather than focus on absolute values for this indicator, I generally want to see at least a stable return on equity over time. The annual dividend payment has increased by 31.50% per year over the past decade, which is much higher than the growth in EPS. 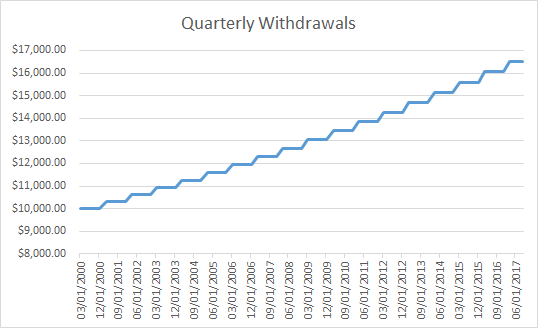 A 31% growth in distributions translates into the dividend payment doubling almost every two and a half years. If we look at historical data, going as far back as 1980, we see that Lowe’s has actually managed to double its dividend every five years on average. Over the past decade the dividend payout ratio increased from 5% to 31%. A lower payout is always a plus, since it leaves room for consistent dividend growth minimizing the impact of short-term fluctuations in earnings. Currently Lowe’s is trading at 16.60 times earnings, yields 2.90% and has a sustainable dividend payout. I recently initiated a position in the stock. I find the stock attractively valued on dips below 22.50. - Where are the original Dividend Aristocrats now? Over the past week, stock markets kept falling around the world. Investors, scared that the economy is about to fall into another recession, fled stocks and went for safer instruments such as US Treasury bonds. Yet, while dividend stock prices fell in sympathy with the broader market, the drops were not as severe. The reason behind this is the fact that some quality dividend stocks are safer than your average stock. In this article I will explain why the market dip has created a perfect opportunity for dividend investors. Many prominent dividend growth stocks have inherently strong business models, which allow these companies to grow earnings and dividends over time. The reason behind this resilience even during turbulent economic conditions is that these companies deliver products or services which loyal consumers are willing to purchase on a frequent basis, while paying a premium price. Consumers are thus sticking to the strong brands they know, which allow the companies to maintain and grow their dividends even during the most challenging times. Many investors in these quality dividend stocks are long term buy and hold investors, who enjoy receiving a higher stream of dividends every year. As a result, these stockholders are less likely to get scared by the daily fluctuations on Wall Street. Since these investors are living off dividends, they do not have to resort to selling when the market is nosediving on good or bad news. This loyal group of buy and hold investors would likely add to their stock positions, since lower stock prices increase current dividend yields. Dividend investing works in all market conditions, since the dividend payment represents a positive return on investment that is less volatile than capital gains. The decrease in stock prices over the past weeks has many investors scared that the market is forecasting a dip in the economy. This panic has started to create an environment, where enterprising dividend investors could start adding to their positions at cheaper prices. In fact, if stocks keep going lower, this would create tremendous opportunities for enterprising dividend investors to scoop up some of the best dividend stocks in the world at fire sale prices. For a wider list of dividend stocks to consider adding to a dividend portfolio, check my post on core dividend stocks for income portfolios. If stock prices go lower from here, this would create an even better opportunity to acquire well-run companies at fire sales. For everyone else, dividend investing is a perfect strategy where investors get paid for holding on to their investments. Over the past week, the buy and hold mentality of every investor was tested by the precipitous declines in major stock market indexes. Despite the facts that US corporations are sitting on a record pile of cash, that corporate profits are increasing and that stocks are trading at a fairly cheap multiple based off historical valuations, investors are fleeing the market and going into fixed income securities. Leggett & Platt, Incorporated (LEG) designs and produces a range of engineered components and products worldwide. It operates in four segments: Residential Furnishings, Commercial Fixturing & Components, Industrial Materials, and Specialized Products. The company increased its quarterly dividend by 3.70% to 28 cents per share Leggett & Platt is a dividend aristocrat, which has increased its quarterly dividend in each of the past 40 years. The stock currently yields 5.50%. Carlisle Companies Incorporated (CSL) manufactures construction materials in the United States and internationally. The company increased its quarterly dividend by 5.90% to 18 cents per share. Carlisle Companies is a dividend champion, which has increased its quarterly dividend in each of the past 34 years. The stock currently yields 1.90%. Harleysville Group Inc. (HGIC), through its subsidiaries, engages in the property and casualty insurance business primarily in the eastern and midwestern United States. The company increased its quarterly dividend by 5.60% to 38 cents per share. Harleysville Group is a dividend champion, which has increased its quarterly dividend in each of the past 25 years. The stock currently yields 5.20%. Aqua America, Inc. (WTR), through its subsidiaries, operates regulated utilities that provide water or wastewater services in the United States. The company increased its quarterly dividend by 6.50% to 16.50 cents per share. Aqua America is a dividend achiever, which has increased its quarterly dividend for 20 years in a row. The stock currently yields 3.10%. Buckeye Partners, L.P. (BPL) owns and operates refined petroleum products pipeline systems in the United States. The master limited partnership increased its quarterly distributions by 1.25% over the prior quarter distribution to $1.0125 per unit. Buckeye Partners is a dividend achiever, which has increased its quarterly dividend for 16 years in a row. Current yield: 6.60%. Monsanto Company (MON), together with its subsidiaries, provides agricultural products for farmers in the United States and internationally. It operates in two segments, Seeds and Genomics, and Agricultural Productivity. The company increased its quarterly dividend by 7.10% to 30 cents per share. Monsanto Company is a dividend achiever, which has increased its quarterly dividend for 11 years in a row. The stock currently yields 1.70%. Boardwalk Pipeline Partners, LP, (BWP) through its subsidiaries, engages in the interstate transportation and storage of natural gas in the United States. The master limited partnership increased its quarterly distributions by 0.50% over the prior quarter distribution to 52.50 cents per unit. Boardwalk Pipeline Partners has increased its quarterly dividend for six years in a row. Current yield: 7.40%. Alterra Capital Holdings Limited (ALTE), through its subsidiaries, provides specialty insurance and reinsurance products to corporations, public entities, and property and casualty insurers principally in Bermuda, Ireland, the United States, and the United Kingdom. The company increased its quarterly dividend by 16.70% to 14 cents per share. Alterra Capital Holdings Limited has increased its quarterly dividend for 11 years in a row. The stock currently yields 2.60%. STERIS Corporation (STE) develops, manufactures, and markets infection prevention, contamination control, microbial reduction, and surgical support products and services to healthcare, pharmaceutical, scientific, research, industrial, and governmental customers worldwide. The company increased its quarterly dividend by 13.30% to 17 cents per share. STERIS Corporation has increased its quarterly dividend for 7 years in a row. The stock currently yields 2.20%. Hawkins, Inc. (HWKN) manufactures, blends, and distributes bulk and specialty chemicals in the United States. It operates through two segments, Industrial and Water Treatment. The company increased its quarterly dividend by 6.25% to 32 cents per share. Hawkins has increased its quarterly dividend in each of the past 7 years. The stock currently yields 1.90%. The particular bullish fact about these companies, is that each one of them has a long history of consistently raising dividends. For them, sharing their business success with shareholders in the form of paying higher dividends every year is business as usual. Medtronic, Inc. (MDT) manufactures and sells device-based medical therapies worldwide. Medtronic is a dividend chamption which has paid uninterrupted dividends on its common stock since 1977 and increased payments to common shareholders every year for 34 years. The most recent dividend increase was in June 2011, when the Board of Directors approved a 7.80% increase to 24.25 cents/share. The largest competitors of Medtronic include Becton Dickinson (BDX), C.R. Bard (BCR) and Baxter International (BAX). Over the past decade this dividend growth stock has delivered a negative annualized total return of 0.6% to its shareholders. 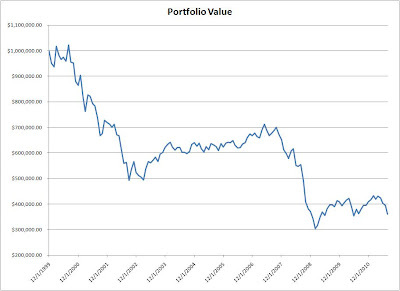 A major reason for that was the fact that the stock was grossly overvalued in 2001, trading at a P/E of over 60. The company has managed to deliver an increase in EPS of 15.20% per year since 2002. Analysts expect Medtronic to earn $3.46 per share in 2012 and $3.79 per share in 2013. In comparison Medtronic earned $2.86 /share the company earned in 2011. What differentiates Medtronic from its competitors is its scale of operations, diversify and depth of products, focus on emerging markets and its culture of innovation. The company has managed to generate higher sales volumes in the past through strategic acquisitions and organic expansions. Future organic growth will be aided by maintaining and growing its strong product pipeline. The company is also focusing on restructuring and realigning its global operations, which is expected to decrease its annual costs by 20 to 25 cents/share by 2012. The company has been able to generate consistently high returns on equity in the 18% -23% range over the past decade, with the exception of 2002, 2006 and 2007. Rather than focus on absolute values for this indicator, I generally want to see at least a stable return on equity over time. The annual dividend payment has increased by 17% per year over the past decade, which is higher than the growth in EPS. A 17% growth in distributions translates into the dividend payment doubling almost every four years. If we look at historical data, going as far back as 1978, we see that Medtronic has actually managed to double its dividend every four years on average. Over the past decade the dividend payout ratio increased slightly from 25% to almost 29%. A lower payout is always a plus, since it leaves room for consistent dividend growth minimizing the impact of short-term fluctuations in earnings. Currently Medtronic is trading at 11.50 times earnings, yields 2.90% and has a sustainable dividend payout. I find the stock attractively valued per my entry criteria and I will considering adding to my position in the stock as funds become available. The last decade has been touted as the lost decade for stock investors. The main reason why stock prices have gone nowhere since 2000, is mostly because stocks were overvalued. The shareholders of the following dividend champions however. who purchased them at the end of 1999, were able to get more in dividends than the amount they paid for the stock. In essence, they received their original investment back in the form of dividends, while still retaining ownership of the shares and the future dividend income stream that comes along with it. In order to come up with this list, I looked for dividend champions, which paid out more in dividends between 2000 and 2010, than the price of their stock on December 31, 1999. To summarize, it matters what price you pay for a dividend stock. In addition, a high yielding stock must be able to maintain and grow the distribution for the foreseeable future. If you buy a stock for the high yield, but the dividend payment is unsustainable your dividend income will suffer and your investment will be worth less. If you purchase a stock with a low current yield, make sure it is trading at attractive valuations and that it is cheap. Then make sure that the business can afford to grow the dividend payment. Master limited partnerships dominated the list of consistent weekly dividend increases for a second consecutive week. Master limited partnerships are pass-through entities, which are mostly engaged in transportation, storage and distribution of oil and gas. MLPs are monopolies, which typically enjoy toll-booth type business models. MLP investors are called limited partners, and the shares are called units. MLPs are not taxed at the entity level, but at the individual unitholder level. The K-1 tax package details each individual partner’s share of the partnership’s income and expenditures from various sources. In addition, unitholders need to understand the difference between general and limited partners as well as tax implications for holding MLPs in tax deferred accounts. Last week I mentioned that MLPs seems like the perfect dividend growth stocks, given their high yields and distribution growth. They do have some risks however, including interest rate, regulatory and business risks. Alliance Resource Partners, L.P. (ARLP) engages in the production and marketing of coal for utilities and industrial users in the United States. Alliance Holdings GP, L.P. (AHGP) is the general partner for ARLP. Alliance Resource Partners (ARLP) raised its quarterly distributions to 58.25 cents/unit. Alliance Holdings GP (AHGP) raised its quarterly distributions to 58.25 cents/unit as well. ARLP has raised distributions for 9 years in a row and yields 3.00%. AHGP has raised distributions for 6 years in a row and yields 4.70%.